With the generous support of the Georgetown Island Education Foundation, the Roger Renaud Music Foundation, and the Bath Elementary PTA a quartet of performers from the Heifetz Institute, the highly regarded string instruction program and accompanying festival in Staunton, VA, return to Maine for a four-day residency in MidCoast Maine featuring a series of school, civic, and outreach events culminating in a public concert Oct. 25th at the Meetinghouse. Renowned around the world for its training of the next generation of great string players. 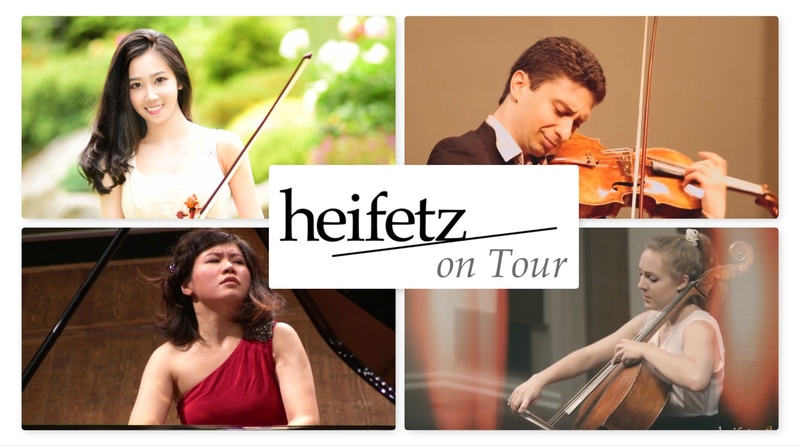 “Communicate – Engage – Inspire” is the motto of the Heifetz Institute, and you will witness living proof of that mission with three brilliant Heifetz alums – violinist Melody Yuan,violist Matthew Cohen and cellist Noémie Raymond-Friset – joined by the outstanding young Heifetz faculty pianist Zhenni Li. The concert will feature these young Heifetz artists in suites, serenades, sonatas, and showpieces – as well as some great chamber masterworks. Performances will include Igor Stravinsky’s infectious Suite Italienne, the dazzling Carmen Fantasy by Hollywood composer Franz Waxman, the riveting 32 Variations in C minor by Beethoven, as well as the passionate Piano Quartet No. 1 by Gabriel Fauré. This concert is part of the Meetinghouse’s commitment to bringing a wide range of musical genres to play on our upstairs stage, a space built for the era of string instruments. Concert starts at 7:30 PM, Doors open at 6 PM. ​We have two dinner options for you. Choose to take a trip to India with our sumptuous chicken curry ($18) that is fragrant with spices in a delicious coconut sauce served with peas and rice, or go vegetarian with a Pesto all Genovese (basil) penne pasta ($16) served with bread. Both dishes come with a side green salad. Please reserve in advance! Drinks available before and throughout the show and following the performance there will be a reception to meet the artists. Show tickets are $22.50 – dinner is an additional cost. We have discounted tickets for students and CHILDREN UNDER 13 ARE FREE. Seating is limited so please buy your tickets in advance! Violinist Canadian Melody Ye Yuan attended the Heifetz Institute student for the first time as a member of the Ashkenasi/Kirshbaum Chamber Music Seminar. A full-scholarship student at the New England Conservatory under Professor Donald Weilerstein, Melody has racked up an impressive string of honors and awards since beginning her formal studies at the age of 5 in China. Melody moved to Vancouver, British Columbia at age 9, and within a year she was a honored with Third Prize in the Canadian Music Competition. From there, Melody won First Prize at the Yuri Yankelevitch International Violin Competition 2009 in Omsk, Russia at the age of eleven, the Gabora Prize for the best performance at the Casalmaggiore International Music Festival in 2012, 2013, and 2014; First Prize at the Bjorn and Lori Hareid Strings Competition at the Vancouver Academy of Music, the UBC Concerto Competition in 2016. Melody is also the recipient of both Arts Scholarships and Touring Grants from the BC Arts Council, and has performed several times with the Vancouver Symphony Orchestra. She has also performed in Italy, Germany, Russia, Austria and her birthplace of China. Melody plays a Carlo Giuseppe Testore violin, made in 1708. Cellist Noémie Raymond-Friset (Heifetz 2017 and Heifetz On Tour) has been called one of the most promising Canadian cellists of her generation, Noémie is a passionate musician, praised for her sensitive and refined playing. She began playing the violin at age 4, and switched to the cello at 7. She has a master’s degree from the Université de Montréal, and is currently studying with Heifetz Institute faculty member Steven Doane at the Eastman School of Music, after having previously been in the graduate diploma program at New England Conservatory. NEC selected her to attend the Amsterdam Cello Biennale Festival, where she entered the Lutoslawski International Competition. Her critically-acclaimed performances include a Yo-Yo Ma master class to an audience of 800, the Saint-Saëns concerto for cello and orchestra, and the first movement of Dvorak’s concerto with the National Arts Centre Orchestra, and Vivaldi’s concerto for four violins and cello with Pinchas Zukerman playing first violin. As a laureate of the 2015 Canada Council for the Arts Musical Instrument Bank, Noémie plays on a Joannes Guillami cello dating from 1769, on loan from the CCA. HeifetzPEG chamber music instructor Matthew Cohen is a 2013 alumnus of the Heifetz Institute and a frequent Heifetz On Tour performer. He made his Carnegie Hall debut at the age of 15 as a soloist in the New York premiere of Tomas Svoboda’s Sonata #2 for orchestra and solo string quartet. He returned to Carnegie Hall in January to perform York Bowen’s Phantasy for viola and piano in Weill Recital Hall. Recent accolades include 1st prize at the 2015 VIVO International Competition and special prizewinner at the 2014 Primrose International Viola Competition. Matt has studied at the Juilliard School, Cleveland Institute of Music, and Colburn Conservatory and has performed as a soloist numerous times with ensembles such as the Colburn Orchestra, Oregon Sinfonietta, and Oregon Symphony/Oregon Ballet Theater. During the past season, Ms. Li made her debut recitals in Carnegie Hall’s Zankel Hall and the Berlin Philharmonie, as well as her debit CD recording titled Melancholie on the Steinway & Sons label.